Q: Is Jon Stewart left handed? 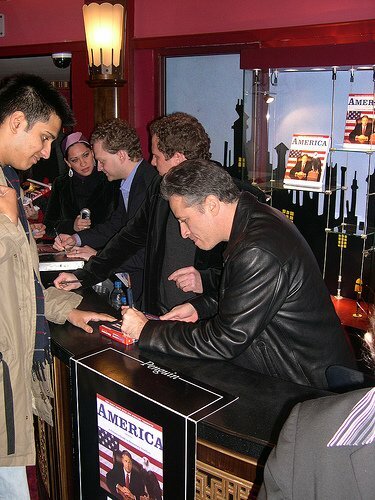 Yes, Jon Stewart is left handed. Jon Stewart, host of The Daily Show, is right up there with most celebrated of the left handed community. A risen star of comedic reason, he is the voice from which all 20-somethings get their news, which could be surprising because it’s the flagship show on Comedy Central. He ascended the late night cable ladder, first writing for and later appearing on The Weekly Show. The success of that show proved worthwhile for Stewart, who was signed to his own show on FOX, called The Jon Leibowtiz Hour with Jon Leibowitz. Ratings were mediocre at first, but increased when Jon changed the title to 48 minutes with Jon Leibowitz, which he thought more accurately described his on air showtime. When FOX decided the show got too popular for it’s own good it was cancelled and Jon took a hiatus in Africa. Jon graduated from The College of William & Mary, where he and future Congressman Anthony Weiner were good friends. They were known for being funny men on campus, often pranking one another. They made elaborate use of the technology at the time, using tape recordings to distract professors and faxing pictures of their privates to each other. Their senior year Weiner bet that Jon wouldn’t use his middle name as his last name and Jon agreed on the condition he could spell it “Stewart”. Not many people know the truth about the origins of The Daily Show. As American attention spans shrunk, test grades dropped and unemployment rose, the United States Government decided to enact a secret program to re-educate and motivate the youth. The Daily Showwas created as a solution for the growing epidemic, which doubly served to alleviate the plummeting weekly program ratings. It was decided that Comedy Central was the perfect placement for such an experiment, following such popular shows as Beevis and Butthead, and Crank Yankers. The program failed to get off the ground, which is mainly attributed to the first host Craig Kilborn’s extremely dry sarcasm and witty delivery being lost on an immature and illiterate viewership. The Board of Comedy Directors decided they needed someone more appropriate for the role, and sought to recover Jon Stewart from the trials of Africa. Thanks to a small microchip that all comedians receive at birth, they were able to track him down in the jungles of the Congo. They arrived and he was persuaded to come back to television on the condition that they help him with his plot to recover the precious blue diamonds from the Lost City of Zinj with his sign language capable gorilla. Their plane was destroyed and they made a harrowing escape from an exploding volcano in a hot air balloon. The newly shaved Jon proved a success to The Daily Show, revitalizing a nation and satiating the calorie-driven, ADHD raddled minds of their viewers with some knowledge veiled in humor. The show was such a success that the Government decided to try it’s experimental human cloning technology on Jon, creating who we know today as Steven Colbert and Sherri Shepherd.